Say what you want about what the Yankees have done this offseason — or, more accurately, what they haven’t done this offseason — but they have been one of the most active teams in baseball. The Cubs, Dodgers, and Red Sox have been very quiet while the Astros and Brewers have made one notable free agent signing (Michael Brantley and Yasmani Grandal) and done nothing else. The Yankees and Nationals have been busy. That’s about it. That doesn’t include Jordan Montgomery, who is on the mend following Tommy John surgery and is due back sometime around the All-Star break. I wouldn’t count on him for anything only because it is not uncommon for pitchers to struggle when they first return from elbow reconstruction. Montgomery could give the Yankees a nice boost in the second half. I think it’s more likely he’s a 2020 option. Even with five good to great big league starters plus some quality options behind them, the Yankees are still in the market for more rotation depth. Jon Heyman reports that, while the Yankees continue shopping Gray, they are also seeking another starting pitcher. 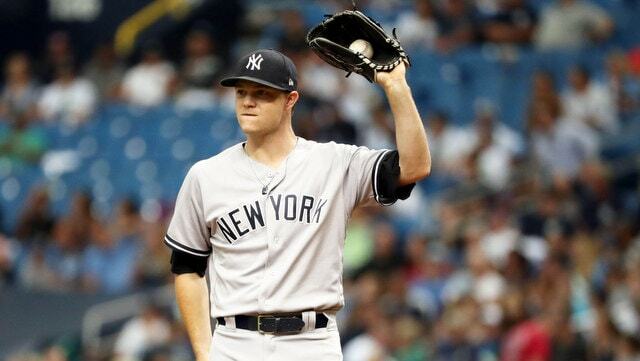 We’ve heard nothing about the Yankees wanting another starter since re-signing Happ. Now, four weeks before camp, they want another starting pitcher. Three possibilities here. 1. They want a better sixth starter than Gray. The most likely scenario. The Yankees have made it clear they do not believe Gray can succeed in his current environment and, in that case, he doesn’t really qualify as rotation depth. Trading Gray, which is still very likely, and then picking up another sixth starter/swingman type strikes me as the most likely outcome. The Yankees figure to even save some money in the process. 2. They have something bigger in mind. The Yankees have been connected to Corey Kluber pretty much all winter. They could revisit those conversations with Miguel Andujar or Gleyber Torres as the centerpiece, then roll with a six-man rotation until someone pitches his way into the bullpen or gets hurt. It should be noted the Indians have shed considerable payroll in recent weeks and presumably aren’t as desperate to clear salary, meaning keeping Kluber is more viable than it was earlier this winter. This seems like the least likely scenario to me. 3. It is business as usual. Yeah, this is possible. The Yankees could be looking for another starting pitcher the same way every team is always looking for a starting pitcher. The day a general manager stops looking for ways to improve is the day he should be replaced. Brian Cashman & Co. wouldn’t be doing their jobs if they weren’t scouring the market for possible upgrades, even if we are only talking about a potential sixth starter. This could all be nothing more than standard operating procedure. Sabathia’s heart procedure and Gray’s ineffectiveness have made finding a reliable sixth starter a greater priority for the Yankees than it normally would be. Can they find a free agent willing to sign to be a sixth starter? It’s usually a last resort thing, and that goes double in Yankee Stadium. Who wants to sign a contract to be a sixth starter in a home run happy ballpark? It’s the last place I’d want to go. At this point, I would be very surprised to see the Yankees swing something big, like trading for Kluber. They’ve been taking small nibbles all winter rather than great big bites. Spreading the money around is not my preferred strategy — especially for a team with the Yankees’ resources — but it can work. Trading for Kluber or signing Dallas Keuchel would run counter to that. Trading Gray and replacing him with a cheaper and possibly more reliable swingman is the most likely outcome to me.